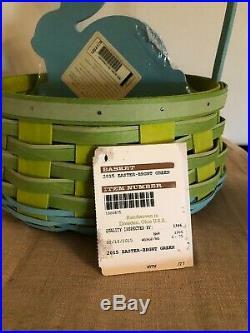 Longaberger Retired 2015 Easter Basket & Protector. Bright green with Turquoise Weave. Includes turquoise bunny divider. Measures approximately 10″ diameter, 4″ tall and 15 tall with handle. Brand new with product card & bunny in origial shrink wrap. 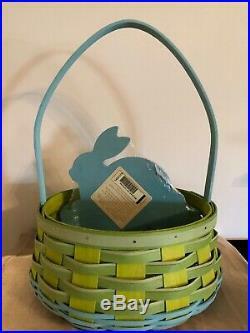 The item “Longaberger 2015 Easter Basket Set Bright Green with Turquoise Bunny Divider” is in sale since Wednesday, April 10, 2019. This item is in the category “Collectibles\Decorative Collectibles\Decorative Collectible Brands\Longaberger\Baskets\2005-Now”. The seller is “treyetta” and is located in Shirley, Indiana. This item can be shipped to United States, Canada, United Kingdom, Denmark, Romania, Slovakia, Bulgaria, Czech republic, Finland, Hungary, Latvia, Lithuania, Malta, Estonia, Australia, Greece, Portugal, Cyprus, Slovenia, Japan, China, Sweden, South Korea, Indonesia, Taiwan, South africa, Thailand, Belgium, France, Hong Kong, Ireland, Netherlands, Poland, Spain, Italy, Germany, Austria, Bahamas, Israel, Mexico, New Zealand, Philippines, Singapore, Switzerland, Saudi arabia, Ukraine, United arab emirates, Qatar, Kuwait, Bahrain, Croatia, Malaysia, Chile, Colombia, Costa rica, Dominican republic, Panama, Trinidad and tobago, Guatemala, El salvador, Honduras, Jamaica, Viet nam, Uruguay.